This stand was likely an abandoned field or pasture that has become a white spruce forest. Signs include the large amount of white spruce that borders the homestead surrounded by rock walls and wire fence. You may want to check the surrounding soil. It it is flat, it may indicate earlier farm cultivation. 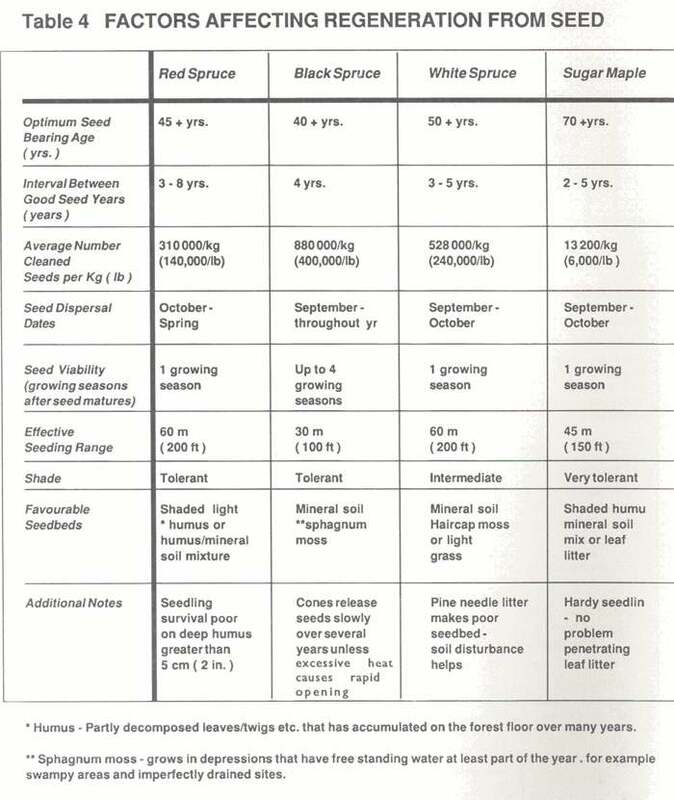 Table 3 tells us that white spruce stands generally mature between 40-60 years. This stand is likely mature or nearly mature and should be harvested within the next 20 yeas as it begins to show signs of decline. White spruce stands usually do not regenerate well even with shelterwood cutting. The forest floor should be assessed for existing natural regeneration before harvesting. tHe stand will likely need to be planted. The unevenaged condition and pioneer species such as white birch and pin cherry indicate that cutting took place in this stand 20-50 years ago. 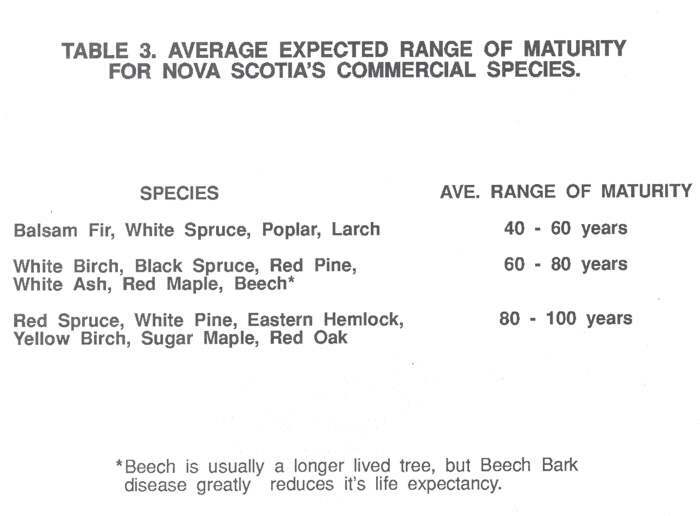 The presence of shade tolerant species like red spruce, yellow birch, sugar maple, and beech shows that the site was probably dominated by these species in the past. Historically, stands closest to the homestead were used for fuelwood. Some pulpwood or logs were also cut each winter for extra cash. This stand is generally immature and should only be considered for stand establishment if significant areas are either understocked or occupied by low value species. If either of these situations do exist, assess the site for desirable natural regeneration. A release cut can be done if adequate regeneration is present. If regeneration stocking is inadequate, it may be best to clear the site and plant more desirable species. If the stand is adequately stocked with good quality trees, thin the dense areas to favour the desirable species. Otherwise, this stand could be left to grow for 10-20 years then reassessed for stand establishment practices. The stand is evenaged and likely resulted from a clearcut. Red spruce, eastern hemlock, sugar maple, yellow birch, and beech advance regeneration were probably present in the original stand. The red maple may have originated as sprouts, but like the white birch, may have seeded in on logging trails or openings. The advance regeneration of the shade tolerant trees died or below down. This stand was likely saved from harvesting because of the long distance from the road and by the swamp. The stand can give us some insight into what the other two forest stands may have looked like. 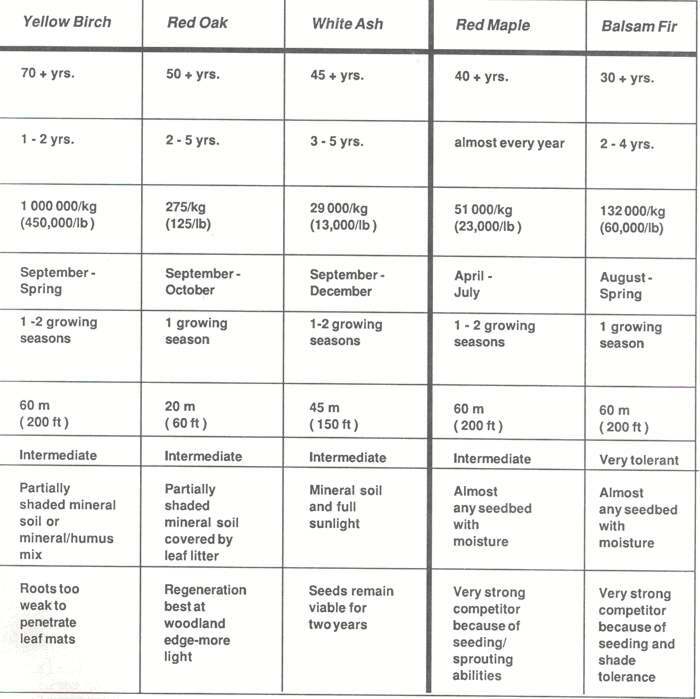 As noted in Table 4 ( A + B ) of Lesson 2, we see that the white birch, red maple, and beech are likely overmature and are beginning to die. The red spruce, sugar maple, yellow birch, and eastern hemlock are reaching maturity. The site should be assessed for regeneration. If necessary, shelterwood cutting could be started.